If you have never had a Sopapilla before, friend, you are in for a treat today. Sopapillas are basically quick donuts. My family used to always stop at Casa Bonita in Tulsa, OK, after visiting my great grandmother, Lula, every summer before she passed away. The trip was always made memorable by Lula. She was a real firecracker. But, being a kid who loved to eat sweets, I also always looked forward to filling my plate with warm, sugary Sopapillas! These are made from a yeasted dough, usually cut into squares or triangles and then fried so that they puff in the center. My dad taught us to tear off a corner and drizzle in a little honey into the puffed out pocket. I’ve also heard that some restaurants will serve them with sweet or savory fillings. If never had Sopapillas this way before, but it sounds awesome! I decided to try using a cookie cutter to create a slightly less traditional shape (stars), and I was delighted to find that they puffed up perfectly as well. Classic Sopapillas, makes 24-28 (depending on the size and shape you choose). Slightly adapted from here. In a small bowl stir together the warm water and sugar until the sugar dissolves. Stir in the yeast and allow this to sit for 6-8 minutes (it should activate and will look foamy). In a large bowl stir together the flour, salt and cinnamon. Stir in the yeast mixture and melted butter until a loose dough ball forms. Turn out on to a lightly floured counter and knead for 4-6 minutes, until the dough begins to become elastic. Place in a lighlty oiled bowl, cover and allow to rise for an hour. The dough should just about double in size. Punch down and roll out on a lightly floured surface so that it's about 1/4 inch thick. Cut into triangles, squares or other fun shapes. In a large, heavy pot heat enough oil, so the Sopapillas can float to around 375°F. Fry the Sopapillas until browned, about 2 minutes. Then flip so that each side cooks. Remove to a plate lined with paper towels to remove excess oil, sprinkle with sugar. These look like they would be great with watermelon at a summer picnic! i’m from oklahoma! casa bonita was one of my favorite places! the sopapillas were always the best part. Mmmm I love sopapillas! 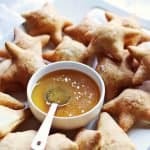 I love how you’ve cut them into star shapes – I will definitely have to try this recipe out. yum! the stars are so cute! These look amazing! I really love your recipes, Emma. mmm yum! drizzle with honey and sprinkle some cinnamon sugar on top…. the best ever. These are a family favorite in our house. It was always the highlight of our family drive through New Mexico. They are very delicious with a savory filling of roasted Hatch green chiles and cheesse. Hi, here in Chile we made sopaipillas with pumpkin, and we eat them with mustard, ketchup or pebre. They are delicious! Ooh these look so good…especially with hot fudge! In Greece we call them:”loukoumades”!! They look definately tasteful! Oh my gosh, my family used to get these at an old restaurant chain until they went out of business! I’ve been trying to find them somewhere else for years! Sooo delicious. Hi Emma, I love your recipes but could you post some lighter and healthier ones more often? I know you’ve said before that you eat only a small amount of what you bake and freeze a lot too or give it away. It’s just that I think myself and many of your readers would actually use the recipes more often if they were healthier- obviously you don’t eat this old yourself in large quantities or probably even in medium quantities to maintain your healthy appearance! Oh my! I love everything yeast-y, definitely have to try this! yum! these loo delicious–and would pair well with the whiskey lemonade recipe–just tried that last week and am hooked! These look beautiful and SO good. I love the stars! These look great! And I am a huge fan of honey on just about anything. They look great, do you have a deap fryer? They would be good with agave too! or maple syrup! YUM. When I lived in Texas, there was only one restaurant in the town I was in, that made them this way – very traditional and delicious. The other restaurants made “quick sopapillas” by frying flour tortillas. When you’re short on time, those are delicious, too. Then again, you can put cinnamon sugar and honey on anything and I’ll think it’s delicious. Except for maybe pickles. Thanks for the great recipe – I can’t wait to try this and think back to my childhood in TX! Another must-try!! Would be great for the kiddies too! oh man, filled sopapillas with fig jam or dulce de membrillo (like a thick quince jelly…yum! )are the best. my amiga in uruguay taught me how to make them from scratch while i was there and i love them. That’s awesome. There’s this restaurant in AZ that serves huge fluffy sopapillas after the meal with honey. So.Good. Never heard of these before, they sound delicious though! Where did you get the tea towels? I love them! Thanks for this recipe! I worked at a hole-in-the-wall Mexican restaurant while in high school and had more than my fair share of sopapillas. So yummy! Ohhhhhhhhhhhh my goodness. Baby you have done it again! These look mouth watering! Those look so good!! I’m gonna have to try them here real soon! I too remember Casa Bonita. Ahh those sopapillas. I remember a buffalo head vaguely??? My husband, who is from Mexico, had never heard of sopapillas until I made them for him. Its been a while, but that honey goodness is amazing!! These sound amazing! I live at a high altitude, will it still turn out right if I use the same recipe? Sopapillas are amazing! I’ve only found one good restaurant where I live that serves them and I can’t resist eating an entire plate full. Oh I really want to try it! 🙂 It looks so tasty! I’m so used to eating sopapillas as a yeast tortilla with cinnamon and powdered sugar on it. Its amazing how different Latin American Cultures can get with food. I’m used to empanadas as fruit filled pastries that I can buy at the Panderia, but when my friend’s Colombian mother made my family empanadas I was shocked to take a bite and find cooked meat inside! I like being surprised by that, because its just a reminder that we may have similar sounding food names, but they can be a totally different delicacy than what we’re used to! In Chile we make sopaipillas, specially when it rains, but the dough is made with squash. I like them with sugar, but they are also served with chancaca, and on the savory side, mustard, ketchup or pebre (a mix of chopped tomatoes, chives, pepper and other things). Also, they are traditionally cut in circles. Oh those star shapes are so pretty! Gosh you’re spoiling us with the fab recipes lately. I’m thinking, with these and the lovely mojito shots yesterday, its definitely time a party! Oh yum! I have never had those! Casa Bonita was the bomb growing up! I’ll have to try these. I’m sure they will conjure up some fond memories! These look delicious! I’ve never had one, but I’ve always wanted to try them! Ooh! I love sopapillas! In NM, a lot of people eat them stuffed with savory burrito fillings. So good. Wow these look good! I’ve never heard of them before. They look so good!!! I love how you decide to change the shape! mm, nothing is better than a puffy pastry with a wonderful dip! star shaped anything is always a winner. these look delicious! So wanna try them! this sounds so good, i’ve heard of sopapillas but have never tried them. these are cute! These look SO adorable and yummy! looks so pretty and sounds delicious! I’ve always wanted to make these! Thanks for posting this! It looks absolutely delicious. Oh my gosh … YES please! I’ve never tried one before but man do they look good. In the southwest we call this same recipe, but made like a flat tortilla, fry bread. You top fry bread with ground beef, sour cream, salsa, avocados, lettuce, whatever you like on your taco and its called a Navajo taco. One of my favorite foods because my family is from new Mexico and this was our special getting together food- grandma or someone would always make Navajo tacos whenever family was visiting, with all the leftover fry bread for sopapillas after! Try it with new Mexico green Chile if you want it done right! As a native New Mexican, it thrills me that you’ve tried this! YUM! Here in Chile we work pumpkin into the dough and serve them with a molasses glaze! Definitely going to try this, possibly with some powdered sugar, yum! whoa. my high school was down the street from Casa Bonita. i spent many years growing up in that little area. These look absolutely dilectable. I can’t wait to try this recipe out! Oh, I miss sopapillas. I haven’t had any since I left Texas – thank you for this recipe! I love sopapillas! I can’t wait to try this recipe. These look like the Kenyan equivalent of maandazis!!! I definitely have to try them, they look so simple and tasty! Are these the same as New Orleans’ Beignets? This looks really cute. I know that’s weird to say about food but seriously, my kids would love the shapes and the filling. Neat idea! I grew up in New Mexico, and a warm sopa goes wonderful with spicy food because the honey and bread cut the fire on your tounge! Try with hot Mexican food! Those look so delish! I have never made them before but definitely want to try. The ones I grew up with were served with HONEY BUTTER…yep, so good for your taste buds, so bad for every other part of your body. BAH! Sopapillas are on of my weaknesses! YUM!! Being a native Oklahoman, I too loved sopapillas! They’re just not the same here in MI. These look fab. 🙂 I’m a Tulsan and can attest to the greatness of Casa Bonita! Thanks for sharing! I love food in shapes – am I still a child :)? Sopapillas remind me of warm summer nights ending with sticky fingers. These look delcious <3. I definitely wanna try these ! What a sweet way to remember someone special. They look delicious. Thank you for this beautiful and gourmet post. I want allllll of them in my mouth right now!!! NOM!